A Year of Being Here: Raymond Carver: "At Least"
Just wait, to see what's going to happen. 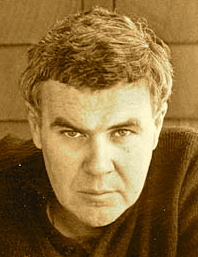 "At Least" by Raymond Carver, from Where Water Comes Together with Other Water. © Vintage Books, 1986. 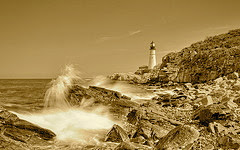 Photograph: "Wave Crashing Portland Maine Lighthouse," by Captain Kimo (originally color). I hear the longing in this beautifully crafted poem. Thank you for sharing. I love it. Thanks Phyllis, why do we have to be reminded of these things? Life is here every day and we miss it!